Anderson Industries announces the offering of a new product for small square bale markets with units available spring of 2015. 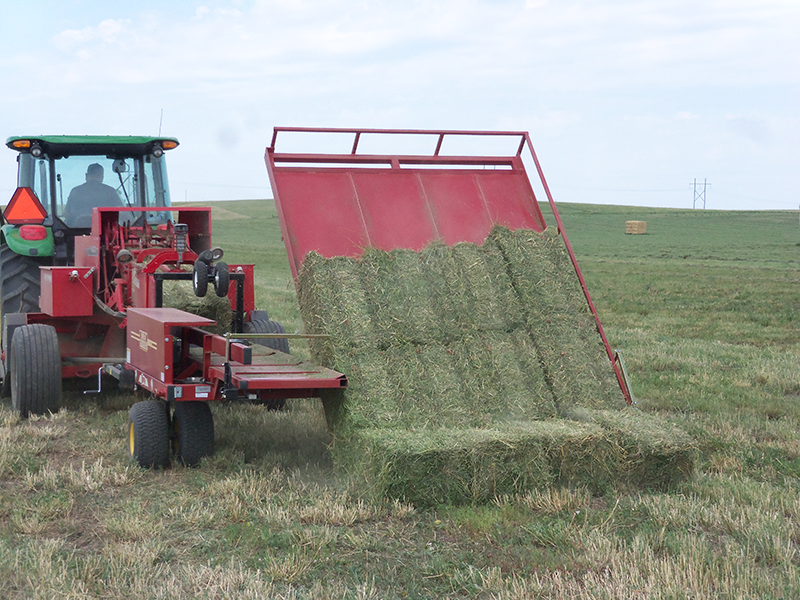 The Bale Caddie, a proven invention by Art Heitz, Jr., of western South Dakota, is designed to make the job of haying small square bales a one-person operation, eliminating the need to load bales by hand. The Bale Caddie and Bale Grabber, a winner of the SD Governor's Giant Vision Award and a finalist of the Inventors Challenge, has been successful in many markets since its creation. The Bale Caddie will now be manufactured, marketed, and serviced by Anderson Industries at its Webster, S.D., manufacturing plant. With continued and growing demand for small square hay and straw bales in the livestock, rural lifestyle and commercial markets, the Bale Caddie is an exciting new product for Anderson Industries to introduce to the marketplace. The new Anderson Bale Caddie is perfect for commercial applications, as well as small farm or ranch operations. The Bale Caddie accommodates balers with up to 100 strokes per minute output through a patented system that provides a very short cycle time. Unlike many bale accumulator concepts, the Bale Caddie’s design allows for uninhibited performance of today’s small square balers. The patented design incorporates technologies that allow for uninterrupted bale flow from baler to accumulator, an exclusive hydraulic system with no cooling requirements, and will maintain the quality and integrity of each bale. Once bales are in either 12 or 8 pack modules, the accompanying Bale Grabber is used for moving the bales from field to trailer or stack with either tractor front-end loader or skid-steer loader. Loader mounts for the Bale Grabber are universal. The Bale Grabber’s unique design pulls bales together from the sides to the center rather than pulling back. Bales are secure and will not fall off in transport and bale integrity is maintained.